Amy Herzog loves helping knitters create garments they love to wear. She’s the creator of the CustomFit pattern generator and the author of Knit to Flatter, Knit Wear Love, and You Can Knit That (all published with Abrams). 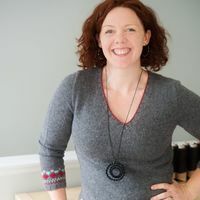 She teaches across the country and on Craftsy.com, and her designs have been published in Rowan, Interweave Knits, and more. She lives in Connecticut with her husband, two boys, two cats, and the button stash she collects instead of yarn. Find out more at www.amyherzogdesigns.com.